Molten lava, volcanic ash, modern grime, salt, humidity. 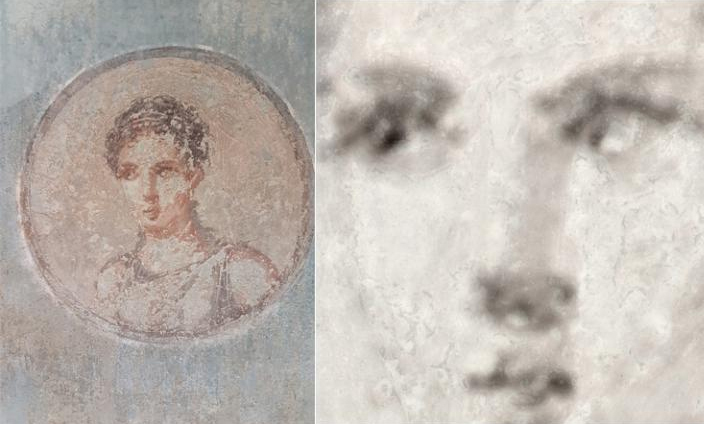 The ancient painting of a Roman woman has been through it all, and it looks like it. Scientists now report that a new type of high-resolution X-ray technology is helping them discover just how stunning the original portrait once was, element-by-element. The technique could help conservators more precisely restore this image, as well as other ancient artworks. The researchers have presented their work at the 254th National Meeting & Exposition of the American Chemical Society (ACS). Herculaneum was an ancient Roman resort town near modern-day Naples on the Italian coast. The city, along with nearby Pompeii, was destroyed during an eruption of Mount Vesuvius in 79 A.D. For centuries, Herculaneum was buried under 66 feet of volcanic material, which helped preserve much of the artwork in the city. Ironically, it was only when Herculaneum was rediscovered and excavation began in the mid-19th century that many of the paintings, frescos and statues started to deteriorate. Humidity, temperature variations, salt and other atmospheric agents have done most of the damage. The portrait of the young woman, for instance, was only excavated about 70 years ago. Del Federico, who is at Pratt Institute’s School of Liberal Arts and Sciences, speculates that when it was first uncovered, the image was probably stunning. But she says just a few decades of exposure to the elements has wrought incalculable damage to it. After she used the method, Del Federico was surprised at how much detail it uncovered. The analysis revealed that the artist had sketched the young woman with an iron-based pigment and then highlighted around her eyes with a lead pigment. High levels of potassium in her cheeks suggested that green earth pigment was used as an underpainting to help create a “flesh” color. But the analysis also revealed much more. “This young woman is gone forever, but our study has revealed in remarkable detail her humanity, her thoughtful expression and her beauty,” Del Federico says.